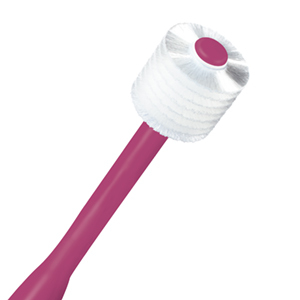 The Brilliant Super Soft Toothbrush by HartFelt revolutionizes the industry with its unique design featuring bristles all-around the toothbrush head. This innovative concept means you can better get in all those hard to reach places to ensure a clean, attractive smile and healthy teeth. Our Super Soft Toothbrush has been designed with cancer patients in mind, who are going through chemotherapy and radiation and have compromised oral care needs (i.e., dry mouth, mouth sores, mucositis). In the battle against cancer, having a soft toothbrush can make all the difference to start and end each day. Designed specifically to nurture sensitive teeth and gums, the Brilliant Super Soft Toothbrush by HartFelt has almost 20,000 extra-soft, micro fine, rounded-tip bristles. 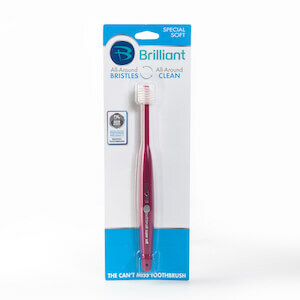 Micro fine, rounded tip bristles are key to the innovation and effectiveness of the Brilliant Toothbrush. This gives you optimal cleaning power that is very gentle, as recommended by dentists and oncologists. Check with your dentist and doctor before using and if bleeding begins or continues. Email here4you@compacind.com if you are interested in being a part of our ongoing research with those experiencing oral care pain during cancer treatments. Thank you.